Swarovski Spotting Scope - An Outstanding Alternative for Photographers. "The latest Swarovski Spotting Scopes combined with a digital camera give you excellent high resolution photographs." I cannot remember which of the many delegates I met at a recent Photography Convention said this to me but I decided to find out if his claim had any foundation. I had wanted an ultra-telephoto lens for quite a while but even the independent manufacturers' lenses needed more cash than I could reasonably justify. First of all I needed to establish which of the many Swarovski scopes would be suitable for my cameras. I contacted Swarovski and was told that any of their scopes would do the job but that the new High Definition (HD) range of scopes would give me the best results for high quality photography. I was also advised that there were a number of ways in which a scope can be attached to a camera, depending on the type of camera. As I intended using it with my SLR bodies, I opted for their Telephoto Lens System TLS 800. It is a photographic lens and telescopic eyepiece in one. When combined with the ATS 80 HD scope and my 4:3 single lens reflex camera it forms a photo unit with a 32x magnification when compared with a standard 50mm lens (35mm format equiv.). The TLS 800 attaches directly to the scope with a bayonet fitting and the camera via a T mount. The T mount for my camera would be an extra acquisition but cost only a few pounds. Before "taking the plunge" I checked the prices of normal photographic lenses with the same reach. I could find nothing of such power but for those which came close (between a half to three quarters the reach, some using converters), prices were all more than £5,000 with the top marque lenses costing between £7,000 to £10,000 at the discount store. Admittedly the Zwarovski package has a fixed aperture of f10.0 and manual focus but for my needs and having learned my photography when it was manual everything, this seemed a mere inconvenience when the huge cost saving was considered - providing the results were of the high quality promised. As soon as the equipment was delivered, I was keen to try it out. A warm summer's evening with plenty of birdsong from the woods behind my garden; so I set up on my patio where I have a good view of the trees and shrubbery. The Swarovski spotting scope comes with clear instructions but I did not find them necessary as assembly is quite straightforward. Because it is a fixed aperture lens and the lighting in the woods was fairly even, I set the camera to aperture priority and light metering to ESP. Although I was using a tripod, I set ISO to 800 to give me a good chance of a shutter speed that would freeze any motion of the bird itself. I could hear a wren nearby so I pointed the scope in its general direction. 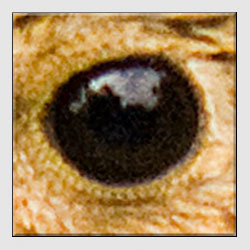 With a lens of this power, I found it necessary to use the alignment aid on its side before locating the bird itself through the camera's viewfinder. Found it - WOW. A good ten yards away but what I saw through the viewfinder is the image at the top of this page. I've never seen such detail in a wren before and had no idea they possessed such beauty. 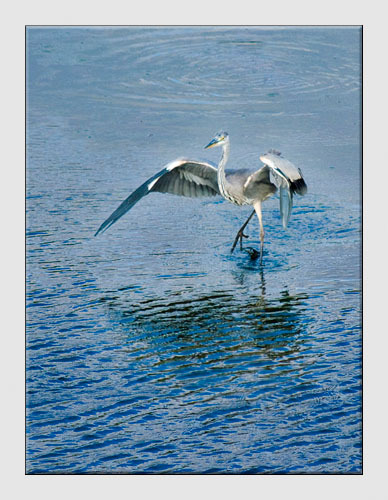 I grabbed a shot immediately - just as well as the bird soon took flight. 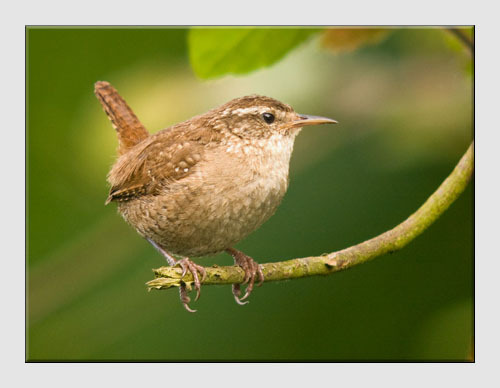 I've since been told by the editor of an ornithological magazine that such a fine photograph of a wren is quite rare. Not a bad indictment of the lens. 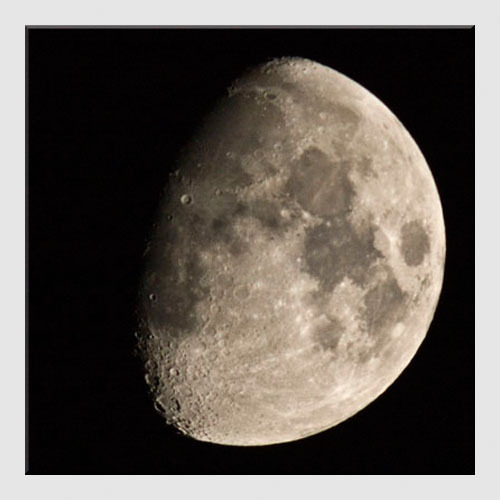 As a photographer, I was also very impressed by the total absence of any vignetting in the image and by its resolution - a quality which became even more apparent in the next example. 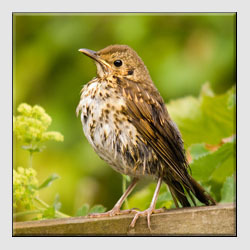 Soon afterwards I noticed a thrush nearby on my garden fence - about fifteen yards this time. Practice was already enabling me to locate the subject in the viewfinder more quickly and manual refocusing of the lens was smooth and easily refined. Once again I followed the fundamental rule when photographing wildlife - take a shot immediately then await the possibility of an even better one. At this distance, and possibly because the bird was young and less wary than the wren, it was happy to pose for me for several minutes. A slight turn of its head revealed a catch light in its eye, a slow even depression of the shutter - job done. 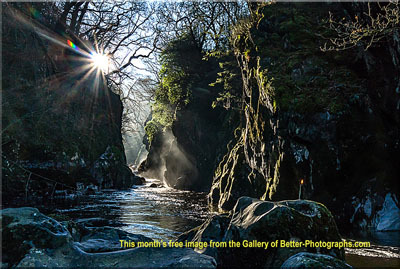 It was not until I examined the image on my PC screen that the outstanding performance of the lens became evident. Not just a catch light, but one which revealed a "birds eye" reflection of the edge of my white conservatory, the red roof on my house, the top of my pergola, the bird table on the patio and white clouds in the blue sky. It was at that moment that I realised that Swarovski Spotting Scopes were more than just a lower cost means of obtaining considerable tele-photo reach. 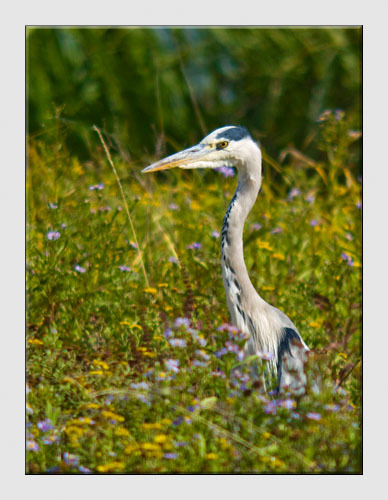 The HD models clearly offer superb photographic quality. Time for dinner so I began to pack up, but suddenly - a call I have rarely heard - followed by a rustling in the undergrowth deeper in the wood. Standing as still as possible, I swivelled the lens around very slowly and focussed on the undergrowth and waited. The quail revealed itself. A quail !! 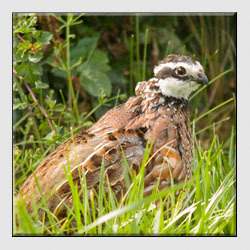 I have lived here for 18 years - woodpeckers, buzzards, even a red kite or two but never a quail before. Without the scope and a huge amount of luck, I doubt anyone would have believed me. Following dinner - not roast quail - I telephoned my son and then a good friend to describe the lens and the results of my first attempts. 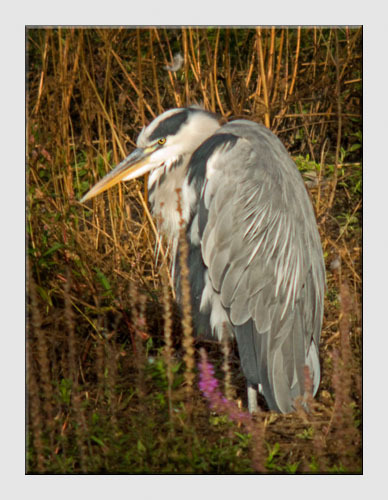 They are both keen photographers so I suggested an outing to the London Wetland Centre at Barnes. 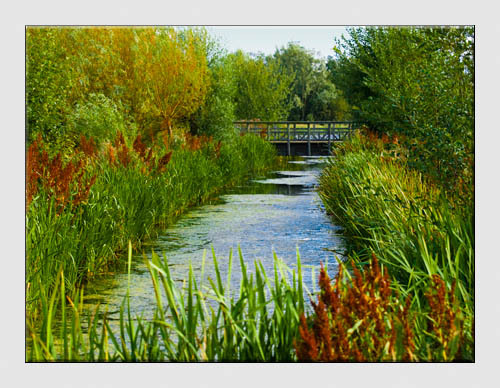 Located on the banks of the River Thames in Barnes, Southwest London the centre is home to rare and beautiful wildlife including Bitterns, Kingfishers and a colony of endangered Water voles. On the day we chose to visit, the herons decided to take centre stage - albeit a stage which was between 50 and 100 yards from the hide in which we set up. These images would not have been possible without my Swarovski spotting scope. Finally, I was keen to try out the scope at night time. A clear night presented the opportunity for me to obtain my most detailed image of the waxing moon in my 50 years behind a camera. As promised - and now in my opinion - "The latest Swarovski Spotting Scopes combined with a digital camera give you excellent high resolution photographs." Now, where are those buzzards and kites? 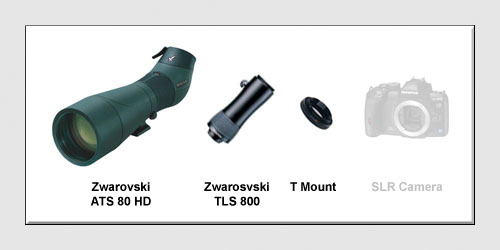 Return from Swarovski Spotting Scope to the Product Reviews page.